This invigorating, mid-level class is for the fearless student who seeks challenge and variety in their asana practice. Expect to work hard and cultivate a spirit of lighthearted play through creative vinyasa sequencing, arm balancing and inversions. 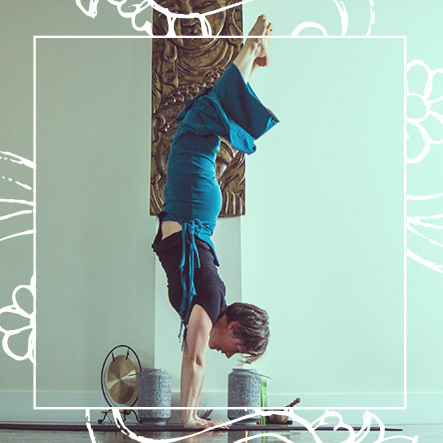 Heighten your mind/body connection and deepen your strength, balance and focus with heat-building flows injected with handstand and arm balance variations and modifications. Inversion and arm balance clinics will be included each week to lay the vital groundwork for success in these advanced postures. Kramas, or stages, will be offered along the way, allowing the practice to meet you where you are in your body each day. When you conquer fear, you conquer inversions. This class is here to help you safely push your limits, whether you are new to the inverted life or a seasoned handstand junkie! Suggested prerequisite: 6 months consistent vinyasa experience. This class is not suitable for those with wrist or shoulder injuries.